At Stiftungsfest — our Founders Day — we brought together four former gymnasts to share about their memories. They represented four decades, but all shared a common fondness for their time at Turner Hall. 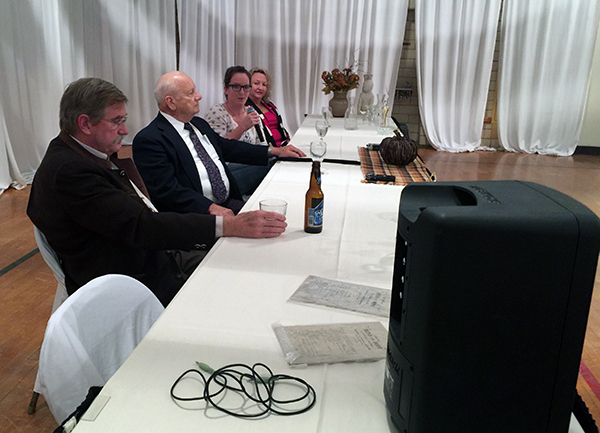 Panelists included (left to right) Ted Marti, Jim Wolf, Christine Boettger, and Elizabeth Domeier. The event made the front page of the New Ulm Journal on Sunday, November 6. Then, on election day, local voters overwhelmingly approved a 1/2% local sales tax to fund five community projects. These were chosen from among many proposals after a careful vetting process, and included a new 10,000 sq. ft. gymnastics facility that Turner Hall will manage. The Turner legacy continues and we welcome your support. Become a member!